Jeff Rice details a small construction project that will produce a dip station for about $50. The dip is an important functional movement that’s an integral part of the muscle-up. Between the muscle-up and ring dips, this movement comes up periodically as part of the WODs at most CrossFit gyms. 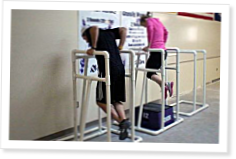 Unfortunately, performing dips on the rings can be challenging to many beginning CrossFitters, so outfitting your gym with a stand to do bar dips—dips on rigid parallel bars—can be important for building the strength, coordination and confidence needed to master ring dips and to get that first muscle-up. While many commercial pieces of gym equipment can be used to perform bar dips, all have their pros and cons, and in my experience of evaluating dip stands for my own gym, the cons outweigh the pros by a wide margin. Making dip stands from scratch is one solution to the problem. In my research for homemade dip stands on the Web, I came across an abundance of ideas. Many involved using steel pipe and fittings. These were often attached to walls to provide stability, or they were welded together to form makeshift parallel bars. While all these solutions have their merits, I was looking for something lightweight and something that could easily be moved around the gym. And, of course, I didn’t want to spend a lot of money on the project. A sandbag is really just a bag of sand. Jeff Rice explains how to save a few bucks by making your own. Awesome. Thanks for doing all the hard work to figure out the details!! Time to go make a new set of paralletts and a dip stand! Does not last, breaks down after a few months of use. Beware. ABOUT TO BUILD ONE MYSELF. WISH ME LUCK! so how long did your dip stations last? what was the average use and weight of each athlete? how about width of an athlete? We've been using these just about every day for the last 3 months. I would guess max weight of my athletes is 230-250lbs. The only issue that I've had with the ones shown in the article is that it is difficult to make the base perfectly flat. This can cause the stands to rock a bit. At FCCF we put a couple sand bags on the base and that stabilizes them nicely. Matt (#3), what size PVC did you use? I don't imagine you built one using my plans since they were just published today. :-) How did you build yours? I've used them and they are AWESOME!!! Great info here. Not everyone can weld but anyone can make one of these. Much appreciated. I've made a similar homemade dip stand and I made it a little wider at the back so it gets narrower the further forward you go into it. My wife and my kids and I can all use the same dip stand. The smaller (narrower) you are, the further forward you are in the dip stand. Looking at Jeff's plans I think they could be modified slightly to accomodate that. I like the plans. Very nice. Wow, great plans Jeff, thanks for sharing! When I first started my affiliate here in Holland I made some PVC parallettes just like the set I made back home in NY, or so I thought. The standard PVC in America, that you can buy in Home Depot or Lowes, is stronger than the standard PVC that you can buy at the local hardware store here. (At least in the Netherlands) Make sure you buy PVC that's rated for a higher pressure. Our Parallettes were all cracked within a month which was a little dissapointing, not to mention I was out 100 euros. The parallettes I made in the states four years ago are still going strong and I'm a 6 ft 200lb guy that likes to do handstands, so just like Jeff said, the PVC can take it. Wow. This is a great idea. Cant wait to make our paralettes and then get cranking on some dip stands. Another critical step to make these last is paint them. It may not last but PVC gets brittle when exposed to UV rays. The Whole setup will last a lot longer if painted. two fence posts bolted into a concrete wall works great too! Hey Jesse - good point! Since I use these indoors 100% (and not near any windows)I'm not too worried about exposure to UV rays. But your point is well taken. Thanks! Thanks Nolan! And thanks for the heads-up about the difference in PVC in Europe and the Schedule 40 pipe that is common in the US -- I hadn't even thought about that. Perhaps that is why some folks have had problems with PVC equipment cracking. I had never heard of that happening until I read some of the posts here. The only time I've seen schedule 40 PVC crack was when it was filled with water and froze... but that's another story! having that in your garage gym even box cuts a lot of the costs! Have you tried to make a stand high enough (and safe enough) to hang rings from? Might have to use fairly large gauge pvc? I imagine something like that would be possible, however there would be some engineering challenges. The first challenge would be overcoming flex in long spans of PVC pipes. You could potentially solve that by using larger diameter PVC or lots of cross-bracing. Both of which drive the cost up -- particularly the cross-bracing. Connectors are the most expensive parts. The second challenge would be stabilizing a rig that was very tall, and very lightweight. Tall + thin + lightweight = easy to tip over. Especially if you are suspending a heavy weight from the top. You'd have some physics working against you there. I picked up an old walker from a thrift store for $3 and pulled the wheels off. Works great for me! To make it stronger - use schedule 80 PVC. Its bullet proof. You can also use the aluminum walkers. Very strong and adjustable. You can buy them use at thrift stores for as little as $10.00. Like your project thanx! Thanks for the shout out! I was wondering when someone would take my design a bit further and enhance it, well done. It is simple and cheap and the one I made 3-4 years ago is still in use, albeit not in my gym anymore. I do like the idea of bolting pipes into the walls, though. Thanks for the PDF and great work! Hey Matt! Your YouTube video was definitely the inspiration for this. Thanks for putting that out there. Glad I could contribute an enhancement and perhaps encourage more do-it-yourself equipment builders -- just as your video encouraged me! Jeff, do you think you could expand it to parallel bars? Awesome! PVC is totally underrated...you can use it for so many things!